Often when people host holiday parties, paper or plastic plates and utensils are used when hosts don’t have enough real plates or they want a simple clean up. For this reason, when attending a large gathering, we usually bring our own place setting, yet we don’t want to bring our breakable ceramic plates. For years, we have brought [amazon_link id=”B000E8OSM4″ target=”_blank” ]Bambu Veneerware Plates[/amazon_link], which surprisingly hold up well to repeated washings, as long as you don’t let them sit wet for too long. We were sent a set of Bambu Kid’s Bamdino® Veneerware® Bamboo Plates from Zenoobi (whose site is unfortunately down at the time of writing this review), “an online retailer of eco-friendly and organic, all natural baby and kids products like organic cotton clothing, all natural bath and body products, eco-friendly toys, bedding and household goods”. 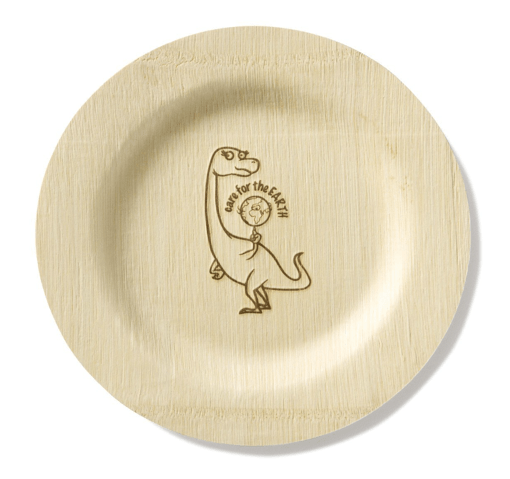 The Bamdino line features cute dinosaurs to appease those parents and kids who want cute decorated plates at parties. A more elegant and green alternative to the paper plate. Kids will eat happily to the bottom of this plate just to see Bamdino® the dinosaur. Stronger, sturdier and creatively designed, these plates won’t buckle from the weight of food like paper plates do. These plates are biodegradable and compostable and are made from Certified Organic bamboo- a renewable resource. This plates beautiful wood surface will accent your most formal occasion from weddings and birthdays, or are perfect for a backyard family barbecue. Made by ‘bambu’, a values-driven company focused on renewable materials and sustainable business practices. The principles foster a close, fair-trade relationship with the workers at the source. Their products and practices have earned bambu Green America’s Green Business Network Seal of Approval. This recognizes bambu’s commitments toward fair treatment of workers, promoting healthy communities, preserving the environment and providing quality products; also evidenced by their IMO certification. bambu’s ‘Certified Organic Bamboo’ is grown without chemicals, pesticides or fertilizers and is sustainably harvested every 3-5 years. Bambu is the only company using Certified Organic bamboo sources for their products. And naturally, they only use water-based formaldehyde-free adhesives. bambu’s products are a testament to fair-trade, sustainable harvesting and inspirational food-safe design. I trust bambu and think these plates are a great alternative to paper or plastic plates, but I would not just dispose of them. They are too expensive for single use, which is not a green practice anyways. Just be sure to wash and dry them right away if you want them to last a long time.